(NewsUSA) - As more consumers appreciate the balanced elegance of lower-alcohol wines, the California wine industry is responding with a new guide that provides savvy travelers to Sonoma or Napa with the best ways to identify and appreciate these beverages. 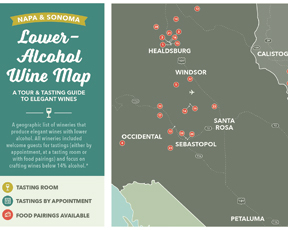 Jordan Winery has introduced the first Napa Sonoma Wineries Lower Alcohol Wine Tasting Map to guide consumers seeking lighter, elegant, low-alcohol wines. "Interest in lighter wines is becoming more prevalent in wine country, as savvy visitors grow to appreciate the food-friendly charms of elegant wines that emphasize fruit and acidity over tannin and alcohol," notes Jordan Winery writer Lisa Mattson in a recent post on WineCountryTable.com. The definition of low-alcohol wine varies; much of Europe considers low-alcohol wine to be anything 13 percent or less. Jordan Winery set the cutoff for its low-alcohol map as below 14 percent, which allowed for inclusion of just 39 wineries -- 26 in Sonoma and 13 in Napa -- about 4 percent of the regions' producers. The neighboring wine appellations are home to more than 800 vintners. Although the Napa wineries include four makers of sparkling wines, the warmer Napa climate is less conducive to lighter wines in general, and produces more cabernets, according to the guide. The map, which will be updated each summer, requires that more than 90 percent of a winery's production is labeled as 13.9 percent ABV or below for inclusion. -Cobb Wines: The pinot noirs from Cobb Wines check in below 13 percent alcohol by volume (ABV). -Corison Winery: Known for Napa Valley cabernet sauvignons that are both powerful and elegant and enjoy a long, interesting life. -Jordan Vineyard & Winery: Cabernet and chardonnay are the focal points of Jordan Vineyard & Winery, with lower alcohol and intense fruit notes that complement a variety of foods. -Nalle Winery: A small family winery that has resisted the high-alcohol zinfandel style for decades; the only Dry Creek Valley vintner on the map. -Scribe Winery: In addition to chardonnay and pinot noir, Scribe Winery offers low-alcohol wine enthusiasts silvaner and riesling at 13.5 percent ABV and lower. For more information about the lower-alcohol, wine tasting map, as well as travel tips for exploring wine country, go to www.WineCountryTable.com.